as I was a child I thought it was just a waste of time. This summer I decided to try to do my best in this, in order to lessen the wrinkles/cancer/dry skin threat. So here you are, my summer skincare routine! I wake up in the morning - is eleven o'clock still in the morning?! ;)- and I apply a simple moisturiser on my face . I'm testing a few kinds of them but at the moment I'm using the Vichy Aqualia Thermal Light which I quite like because it's light and makes my skin really soft. Then I go to the seaside and I must decide which suntan cream to use. 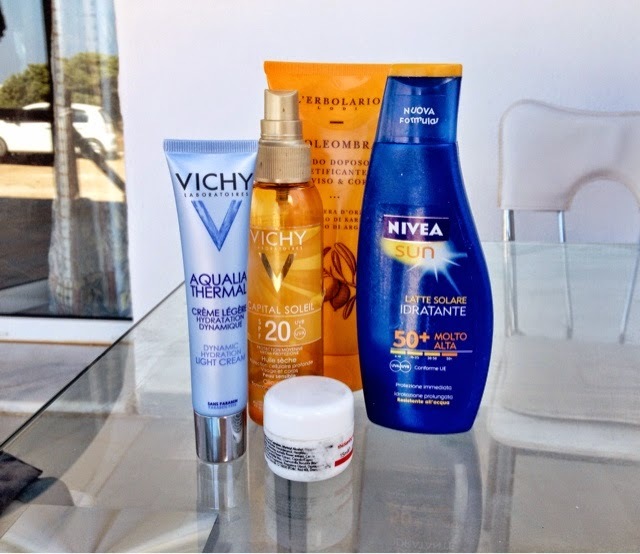 I choose the 50 SPF in the first days - I love the NIVEA Moisturizing Sun Lotion - or the Vichy Capital Soleil Suncare Oil which has a 20 SPF. I apply them when I arrive and after every bath I take. When I come back home, I have a shower an then I put on my L'ERBOLARIO Soleombra after sun, which helps me to rehydrate my skin and to keep my tan. You can also use it as a face mask, especially if you are a bit burned. Finally, before going to bed, I take my little sample of the Thickening Night Cream by CDS which is a stronger moisturiser for the night. My mum gave it to me, probably she took it from her magazine's sellings but I feel like I'm the only one who has it ... - let me know if I was wrong, I'd be very pleased! -. This post was quite simple and quick, just because I'm still a minimalist talking about skincare, so I hope this is enough for my skin. If you have advices, posts skincare related or anything you want to point out to me, I'd be really pleased to have a look at them!